Stumps in the walkway. Saw for scale. For all you people out there who think milk comes from the store, eggs come from the dairy case, and bowl blanks come from Highland, this is for you. There are many ways to do this, but this is my method. 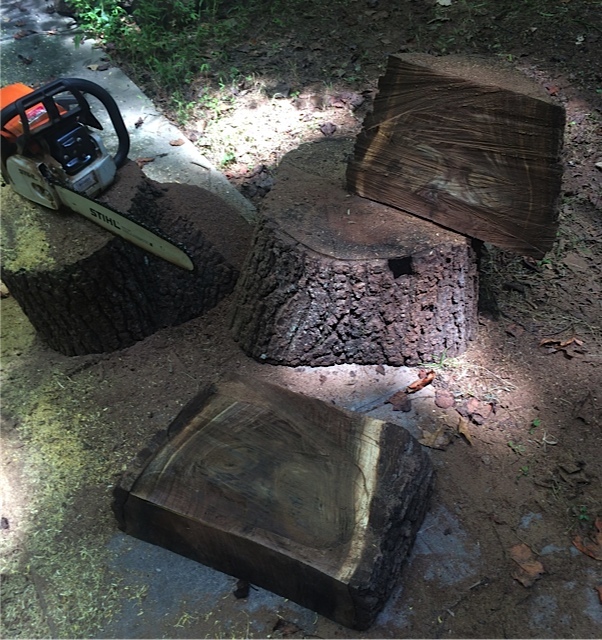 These pieces are too heavy for me to do anything but slide them and tumble them, so I pulled out the trusty chainsaw and went after them. 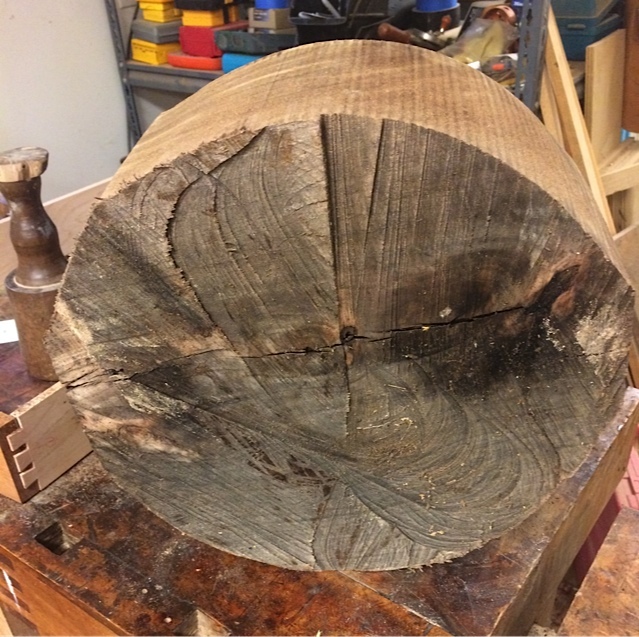 I like bowl blanks with the rim of the bowl set vertically at the pith of the tree and the bottom of the bowl near the outside bark edge. The pith must be removed from the bowl because any crack which develops will run to the pith as the bowl dries. 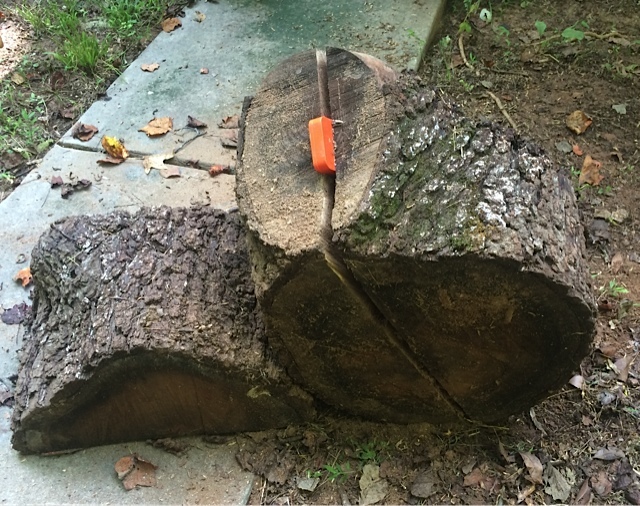 One problem with these pieces near the stump of the tree is that several of them have up to three piths in them. With that many piths, I try to cut so the piths come out near the edge of a blank. 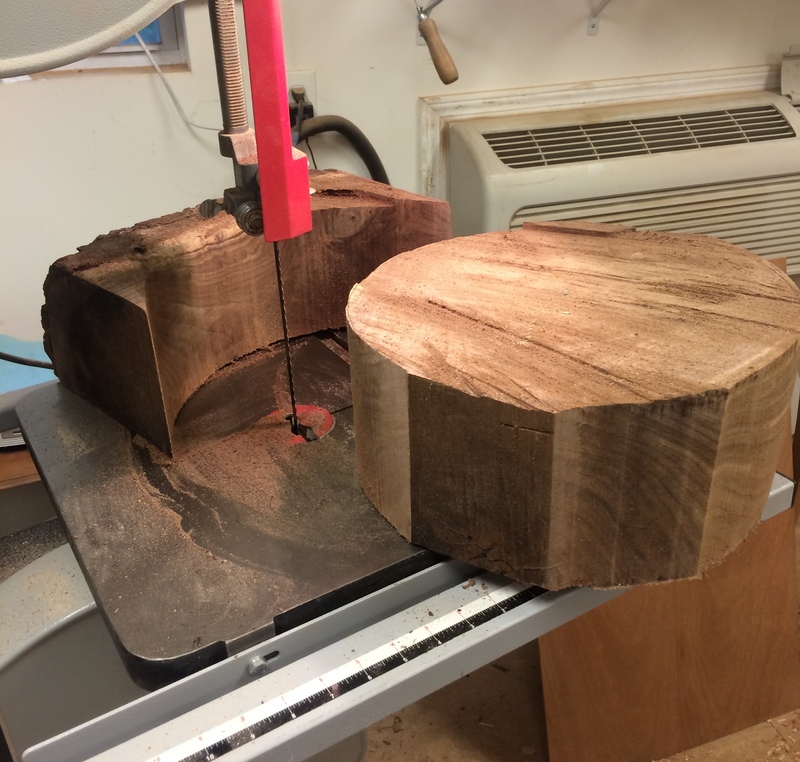 I made a bowl blank from one of these chunks a while back and it is coming out so deep that I don’t like it. So today I decided to limit the bowl depth to about five and a half inches. That is a pretty good bowl — if you are going to use it for salad, you better have a big family. To begin, I sawed a piece in half and managed to get one piece on top of another chunk so I could get to it better. 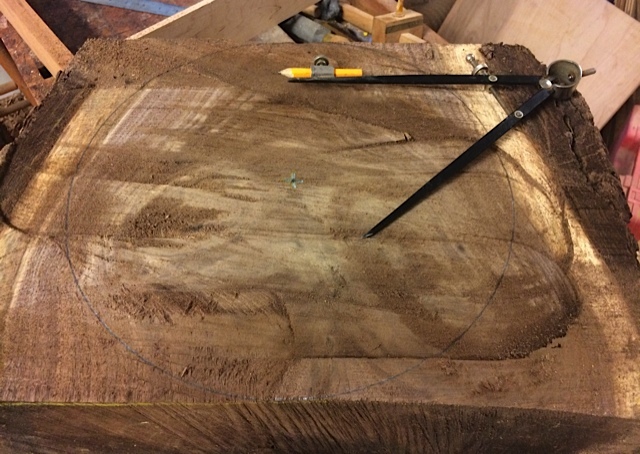 I laid it down flat and then took a random board from the shop and marked a saw line with a yellow pencil at a depth of just under six inches. 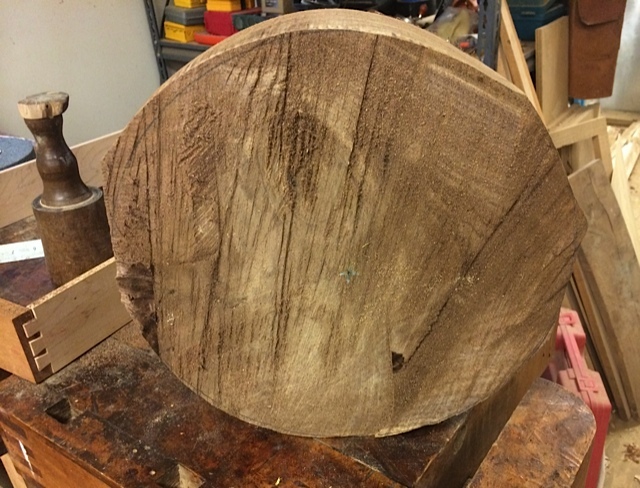 I got a lovely slice with parallel sides that I could put on the bandsaw and make a round blank. With the compass I made a circle on one side of the slice and then put it on my bandsaw with the Highland Woodturners Blade mounted on it. This is a wonderful blade made for the purpose and it zipped right through the circle. One side of the blank had some issues with the pith and the other seemed to be smooth, so I made the smooth side the outside of the bowl and most of that pith will be turned away. Smooth Side will be the outside of the bowl. I mounted my face plate on the future inside of the bowl and stuck the blank on the lathe. 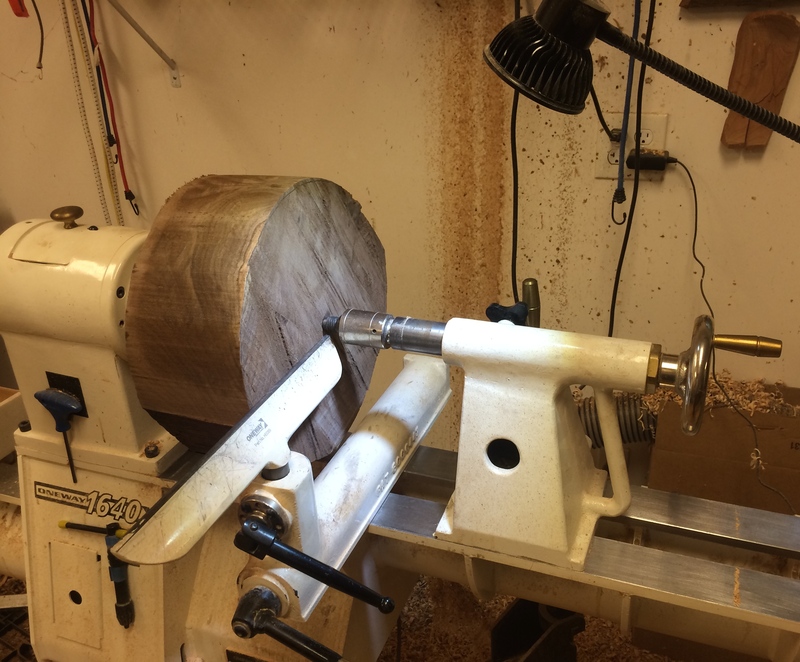 My lathe is a Oneway 1640 from Highland, so it will handle a bowl up to 16 inches in diameter inboard and 24 inches outboard. 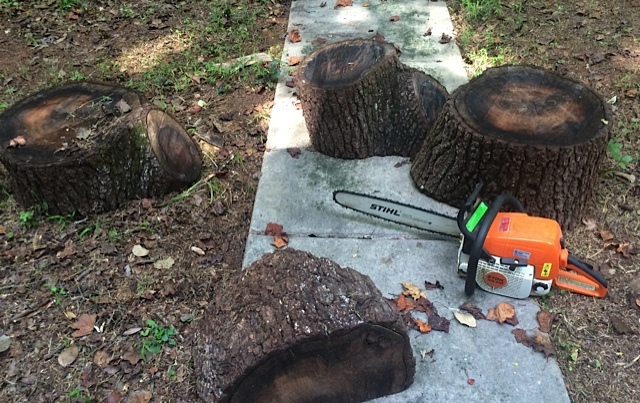 Since these stumps are only about 13 inches, it works beautifully. I love that stripe up the wall behind the lathe by the way. I turn green so that is moisture from the wet blanks. Homemade Bowl Blank Ready to Go. Also note my magnetic LED worklight from Highland. I love that light! Nice post. That’s cool you get chunks of wood from various people. Wood News Online, Number 109 (It Rhymes!) Woodworking in America 2014: Getting Ready!